If you want a code to live by as a cycling champion,take these words that Fausto Coppi, the Italian campionissimo, wrote to the Carpano team in 1958. They quickly became known as the eight commandments of the champion of champions. 1. Good manners are the first requisite of the rider. 2. Show your education by the control of your tongue and by your bearing. A rider doesn't have to be a dandy, but he could be properly dressed. 3. A rider must honor the engagements for which he has signed. 4. Courtesy is the sign of a rider conscious of his responsibilities. 5. Politeness is the foundation of all education. 6. The journalist is the representative of public opinion. The rider is responsible in contact with the Press for his own standing, and he should help it to do its job without ever seeking flattery. 7. Loyalty distinguishes a great rider, in competition and outside it. 8. A rider must control his nerves in all circumstances and must accept good and bad luck with equal serenity. I don't run my mouth! I just break all the rules of Bicycle Racing 101. 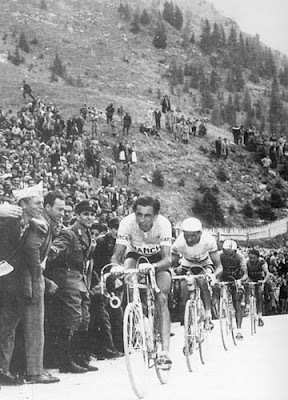 Of course, we all worship at the Shrine of Fausto, but it is better not to look too closely when you read accounts of his later years and how he could only stay in a race by being "medically prepared." Kind of goes along with the, 'if your don't have something good to say then say nothing at all'. Chris - I'm not going to be one of them. Goal for this year is to train hard, win humbly and lose graciously. Rachel - I'm glad you have none of the ego related problems, its easy to get nervous and scream out at the field. Keeping your nerves still is a better practice. Sprocket - I do not keep cycling stars as idols. But these rules seem very apt for racers.